Most of us realise the importance of supporting local producers and cutting down on “food miles” by buying produce from the local area, and the opening of a new farm shop in Alvechurch provides a great opportunity to do just that. 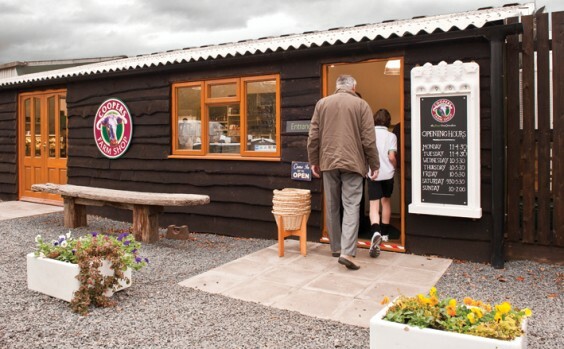 Coopers Farm Shop, conveniently located at Coopers Hill Farm just outside the village, was officially declared open by BBC WM’s Joanne Malin this summer and offers the finest local produce, from English longhorn beef to fresh fruit and veg to deli items and snacks. Everything in the newly-converted farm shop has been either reared, grown or created on the premises or sourced from neighbouring farmers and producers, so customers know exactly where their food has come from. Farm owner Adrian Bytom and business partner Andy Bacon – who met at agricultural college and both have extensive farming experience – set up the family-run shop with the aim of sharing their passion for top quality home-grown food. “We also want to provide customers with an enjoyable shopping experience, and if we haven’t got the item you want, we will endeavour to source it for you from one of our local suppliers,” says Andy. However, it’s unlikely that you won’t find something to tempt you in the well-stocked shop, which features fresh bread baked on the premises, home-baked cakes and pastries, jams and chutneys, and an extensive range of pies, cooked meats and cheeses. The selection of meat is one of the partnership’s main selling points, especially the excellent and unusual beef from the 60-strong herd of English longhorn cattle which graze many nature reserves across Worcestershire. The 100-acre farm also produces its own lamb, mutton and traditional breeds of outdoor-reared pork. “English longhorn is a traditional breed which has recently come back into fashion, but its meat is not found in many outlets,” says Adrian. “The cattle are slower-maturing; they remain outdoors all year and are only fed hay or silage with little or no cereal inputs and hence are termed ‘grass-finished’ beef, by comparison to the continental breeds that are widely marketed and intensively ‘finished’.” “Coopers” are so proud of this breed that an English longhorn is featured in their logo. A butchery service operates five days a week, with customers able to have their meat cut to order, and butcher Matt May makes his own sausages in a variety of delicious flavours. Christmas orders are now being taken. Meanwhile, the wide array of fruit and vegetables, looked after by Hugh Martin, is sourced from the Vale of Evesham – the quality is obvious just by looking at the baskets of colourful produce. As well as the bread baked on the premises, further bakery items are homemade by an associate producer in the Cotswolds – these include indulgent cakes and biscuits like Millionaire’s Shortbread and Rocky Road, plus quiches, sausage rolls (filled with meat from Coopers) and intriguing “flowerpot breads” which take their name from their unusual shape and are flavoured with herbs and seeds. The small deli area, which Andy and Adrian plan to expand, offers cheeses, salads, houmous, olives and sundried tomatoes, while the shop’s shelves also boast free range eggs from a farm in Tardebigge, olive and rapeseed oils, organic drinks, sweets and crisps. ”Coopers” are members of HEFF (Heart of England Fine Foods), which assists regional producers in marketing their products and helps with local sourcing. Further plans for the future include the creation of an outdoor cafe area where customers can enjoy tea, coffee and cake, and a “vegetable box” delivery service. Adrian and Andy want Coopers Farm Shop to be very much a part of the local community, employing staff from the local area and encouraging local producers to get in touch with a view to selling their wares. The business has also sponsored Kings Norton Rhinos’ firework display, a calendar produced by Crown Meadow First School, and is supporting fundraising for St Laurence Church’s Bell Tower restoration. A pre-Christmas tasting day will take place on Saturday November 19, so why not take the opportunity to see exactly what Coopers Farm Shop has to offer?